Having a stockpile of food is essential for every prepper regardless of the SHTF scenario. There are multiple options when it comes to stocking up on food. You can buy canned food, rice, MREs, grow and can your own or freeze dry. 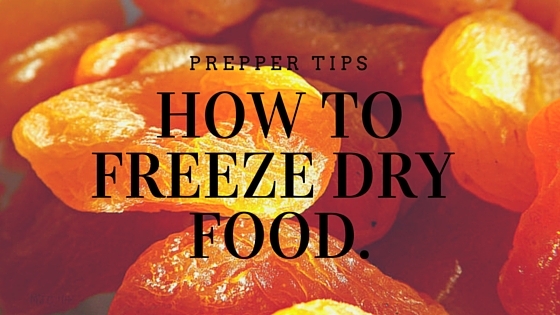 In this article we will be speaking about how to freeze dry food. How to Freeze Dry Food? Freeze drying is a food preservation process which removes the moisture from the food via sublimation, which makes the water molecules turn into vapor. The Freeze-drying of food affects more on its texture as compared to other preservation methods such as freezing and canning, but the flavor and nutritional value of the food stays intact. Because of the fact that freeze-dry foods are very light, they would be great for backpacking trip or storing for your emergency preparedness kit. As a matter of fact, freeze dried foods can last up to 25 years, which makes the process perfect for disaster preparedness. The information below includes the several methods on how to freeze dry food, selection and processes. Others – if you are already familiar on how to freeze dry food, you can try the process for chicken breasts, meatballs, spaghetti, and cheese. You need to understand that any kind of food as long as it contains moisture can be preserved through the use of freeze-drying process. Another thing that you need to consider is to choose the freshest possible food. Freeze drying process of food at its peak freshness or ripeness can help you ensure that it will taste good once it is already reconstituted. Vegetables and fruits should be freeze dried when they’re fully ripe and in season. For full meals, they should be frozen dried immediately as soon as they have already cooked and cooled. Don’t try to freeze dry them after being stored in refrigerator for few days already as they will just taste like leftovers once reconstituting them. Bread – this food is not a great choice for the process of freeze drying because its texture greatly depends on its own freshness. Cookies, cakes and other yeast-based foods are also not a good choice for this food perseveration process. Cut them into small pieces. Slice the potatoes, peppers, apples and other vegetable and fruits into bite-size chunks, so that the moisture can be removed easily after you have successfully learned on how to freeze dry food. Place the foods on a tray or plate. Make sure to spread them out in order for the foods piece not to be clumped together. Place the tray or plate inside the freezer. If possible, you need to ensure that the freezer is empty. Do not open the freezer during the process because doing so will only slow the process of freezing and will cause developing of ice crystals on food. If you happen to have a deep freezer, it would be better to use it, since the foods should be placed frozen at the lowest possible temperature in learning on how to freeze dry food. Keep the food inside the freezer until it freeze dried. The freeze drying process takes about a week until the sublimation process will take place, which will remove the moisture away from the food. Check if the food is totally freeze dried by trying to remove a piece from it and leave it to thaw. If the piece turned black, it simply means that the food isn’t frozen dried yet. Store the food. Once you have successfully completed the freeze dry process, you need to place the food in the freezer storage bags. Ensure to push the air out, and immediately seal the bags, storing them either in your pantry, freezer or in your kit for emergency preparedness. Place the foods in the freezer bags. Lay out the bags flat in order for the food not to bunch in just one corner. Push the air out before you seal the bags. Ensure that the bag are securely airtight sealed. Place the freezer bags with foods in a very large cooler and cover them with dry ice. Before doing the process, ensure to wear long sleeves and gloves to protect yourself against the dried ice. Of you have lots of food bags, alternate the foods bags as well as the dry ice until the cooler is already full. You need to do this to successfully learn on how to freeze dry food. Place the cooler inside the freezer. After 6 hours of waiting, you need to cover the cooler by using a lid. After a day, check the bag of foods inside the cooler and see if dry ice is still present. If it’s already gone, foods are now ready for the storage. Remove the bags from the cooler and transfer them either in your freezer, pantry or kit for emergency preparedness. Place the food on tray or plate. Make sure to spread the food in order for them not to be clumped together. Place the plate or tray inside the freezer until the food is frozen solid. Do not open the freezer during the freezing process in order to avoid the ice crystal formation on the food. Place the frozen foods in vacuum chamber pulled to 120m Torr. Temperature should be set at 50 degrees Fahrenheit or 10 degrees Celsius. The process of sublimation will happen within a week. After a week, check a piece of food in order to make sure that the freeze dry process is complete. For storage, place the food in the airtight containers.